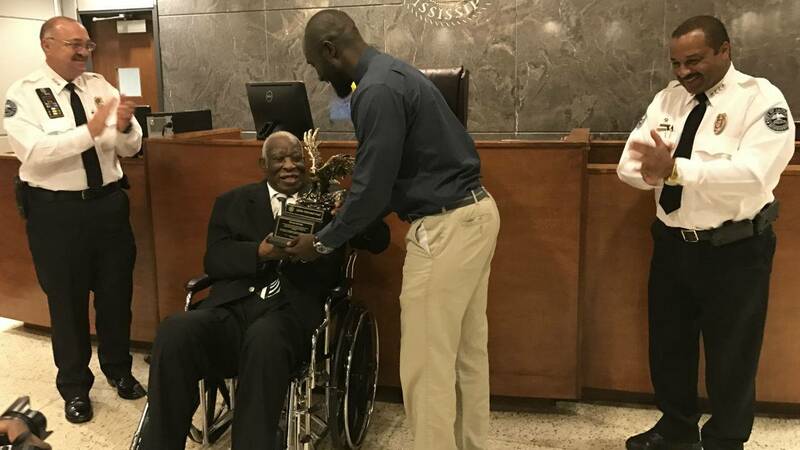 Jackson mayor and police chief honor Land with award. One former Jackson Police Officer is reflecting on more than 50 years of change in the police force. MPB's Alexis Ware reports on the first African American officer in the capital city. "But it's just a job that I didn't know what I was supposed to been doing, and I couldn't arrest no white people." That's Joe Land who amid racial segregation became Jackson's first black police officer in 1963. Despite the badge, he was not allowed to arrest white civilians and could only police in black neighborhoods. "The service I did was just to be serving the people in the neighborhood. Just really keeping the peace." Land says then violent crimes and stealing were not as much of an issue. He says his main role was to monitor disagreements. Today, the Jackson Police Department has multiple black men and women in leadership roles, including the chief. Police Chief Lee Vance says in recent years officers have worked to improve partnerships with the community. He credits that with bringing down crime rates in the city. "We believe in a community oriented policing concept. We choose to work with the community we work within the community, the community works with us. Now, there's no way you can make that type of progress and having hostile relationships between law enforcement and the community." The Jackson Police Department honored Land with a life time achievement award yesterday.